Kudos to myiq2xu for coming up with that ad copy. The Governor of Illinois sounds like he’s a bit tetched. He’s a megalomaniacal, power hungry, corrupt pol in deep, deep denial. His approval ratings are hovering right down there with George Bush. And he *knows* he may be recorded when he flat out asks for a quid for his pro quo. What made him so damn cocky? We have learned from years of the Whitewater investigation that where there’s smoke, there isn’t necessarily fire. It could very well be that Barack Obama had no interactions with his personal Jim McDougal regarding the disposition of his senate seat. But those of us who witnessed how the primary was stolen from Hillary Clinton already know how corrupt Mr. Obama is. A man who gets $600,000,000 in campaign contributions, some of them from untraceable pre-paid credit cards and manages to buy superdelegates to flip and whose campaign organization threatens various states to withhold funds from downticket races if their delegates don’t switch sides, has more than enough experience with buying his way to the top. Some stupid Obamaphiles and media types will say that’s just hardball politics and everyone does it. But when money and favors exchange hands in order to bump someone out of the way and gain you an undeserved advantage is viewed by the skeptical eye of Patrick Fitzgerald, it looks a lot like corruption- and it’s illegal. Barack Obama is already as corrupt a politician as Rod Blagojevich. But as to *this* indictment, this is no failed real estate deal where innocent people are getting caught up in a political vendetta. This is the selling of a US Senate seat coming on the heals of one of the most brazenly corrupt primary and general election seasons I have ever seen in my life. And Patrick Fitzgerald is no Ken Starr but there is a very real possibility that in little more than a month from now, he could be out of work if Barack Obama chooses to replace him. Now why would he want to do that? And Rod Blagojevich is a little bid mad, un poco loco en la cabeza, unpredictable and curiously reluctant to step aside during his indictment. Oh, the things he knows. Even before Mr. Obama was elected president, Mr. Blagojevich was recorded telling an adviser on Oct. 31 that he was giving greater consideration to one candidate (described only as Senate Candidate 5) after an approach by “an associate” of that candidate who offered to raise $500,000 for Mr. Blagojevich, while another emissary of the Senate hopeful offered to raise $1 million. “We were approached ‘pay to play,’ ” Mr. Blagojevich said on a recording. Several people among the half-dozen whose names have been suggested publicly as Senate possibilities did not respond to requests for interviews. Others, including Representative Jesse L. Jackson Jr. and Mr. Jones of the State Senate, who has been one of Mr. Blagojevich’s few allies in Springfield, issued statements expressing shock over the accusations, but they did not answer requests for interviews. 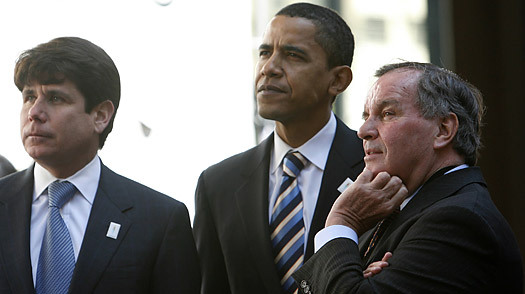 “If these allegations are proved true, I am outraged by the appalling, pay-to-play schemes hatched at the highest levels of our state government,” said Mr. Jackson, who had openly expressed interest in Mr. Obama’s old job and who met with Mr. Blagojevich, whom he is not known to be close to, for 90 minutes on Monday afternoon to discuss the post. I guess we should be grateful that he only offered a bribe and didn’t threaten the state of Illinois with making their legislative agenda dead in the water if the governor didn’t appoint his niece. Still, what goes around comes around. What’s bugging me is his intention. He isn’t putting his hand on her “chest,” as most of the articles and conversations about the picture have euphemistically referred to it. Rather, his hand—cupped just so—is clearly intended to signal that he’s groping her breast. And why? Surely, not to signal he finds her attractive. Au contraire. It’s an act of deliberate humiliation. Of disempowerment. Of denigration. Oh, I know: If Hillary can get over it, why can’t I? Her spokesman, Phillipe Reinnes, tried to make light of the incident. “Senator Clinton is pleased to learn of Jon’s obvious interest in the State Department, and is currently reviewing his application,” he told the Washington Post in an E-mail. Obviously, she has no interest in making a federal case out of this particular incident, particularly as both the Clinton and Obama camps work on letting bygones be bygones. She has to pick her battles, and for her this ain’t a hill worth dying on. But there is a larger issue at stake. At what point does sexist behavior get taken seriously? At what point do people get punished in ways that suggest this kind of behavior, this kind of thinking, is unacceptable? At what point do we insist there will be consequences? Clearly, that didn’t happen during the recent presidential campaign, when Hillary was—as I guess she is now—fair game. The press, the pundits, and the public could say things about her (“She’s a shrew!”) and to her (“Iron my shirt!) that were over-the-top sexist—yet got almost no reaction. Indeed, Ms. Myers, where do we draw the line and hold people accountable? KEEP THE PRESSURE ON GROPERGATE! 2. Send an email to the obama transition team, demanding that Favreau resign!